Himalayan Learning’s finances are checked by the UK Charity Commission every year to ensure that we are accountable and using our resources properly. Our accounts are displayed on the Charity Commission website, and we also add them here. Himalayan Learning received £2,982 in our financial year 2015-16. We spent £2,858. Himalayan Learning received £3,340 in our financial year 2014-15. We spent £3,216. Himalayan Learning received £3,842.97 in our financial year 2013-14. We spent £3,345.87. Himalayan Learning received £3,982.54 in our financial year 2012-13. We spent £3,854.23. Because of the growth of international donors, the amount of income from tax rebates from the UK government fell in the 2007-08 period, however the start of new projects other than sponsorship also minimised the proportion of income from sponsorship. The following pie chart illustrates the sources of income for Himalayan Learning. The following pie chart shows the small proportion of funds that Himalayan Learning uses for administration, this mostly consists of stamps etc for communication, salaries and volunteer stipends, and printing. Another interesting financial year for Himalayan Learning saw a large increase in income due to offering an online shop for sponsors. 2006 saw growth in the number of supporters outside the UK due to technology changes, and a corresponding growth of income. Due to the increased income, Himalayan Learning enlarged the number of children it supported and tripled the number of schools that we give help to. Projects were altered so that they specifically aimed to help women and girls, with a target of 2 in every 3 beneficaries being female. Himalayan Learning also launched a new sponsorship scheme to raise the minimum sponsorship from £7 to £20 and to include a broader range of support to enable children to go to school. The following chart shows how Himalayan Learning spent the income from sponsorships, and does not include other programmes. After a break of one year whilst Himalayan Learning registered with various regulating bodies, 2005 saw a growth of income and diversification of financial programmes. In 2005 25% of Himalayan Learning’s budget was used to test out a number of micro loan schemes whereby women were lent small amounts of money to build sustainable business enterprises – “Micro Credit”. Amongst Himalayan Learning’s usual expenditure on education of children, we also trained tailors and provided them with work to create clothing for the sponsored children. 2003 was Himalayan Learning’s second year of operation and the first accounts were created for the Inland Revenue. 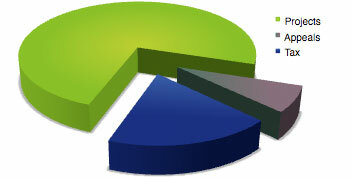 The following pie chart shows how Himalayan Learning spent donations during the 2003 financial year. The price of uniforms and other clothing rose due to Himalayan Learning training, empowering, and employing local women to produce clothing. Some community work was also carried out to provide clean water.